The Gila National Forest is located in New Mexico, and at close to 3 million acres, is among the largest swaths of National Forest in the United States. A portion of the forest, the Gila Wilderness, was in 1924, the first acreage to be designated as a wilderness reservation by the United States Government. The National Forest spans four New Mexico counties of Hidalgo, Sierra, Grant and Catron, with headquarters in Silver City. The park covers a vast and varying terrain of mountains and canyons, mesas, and semi-desert plains. Wildlife within the National Forest includes the Gila monster, the only venomous lizard native to the United States, and the park’s namesake. Other animals specific to the park include the Gila Spotted Whiptail, a smaller non-venomous lizard, the Gila woodpecker, and three types of endemic fish, the Gila trout, Gila topminnow, and Gila western chub. Black bears, white tailed and mule deer, cougars, elk, the timber wolf, bobcat and white-nosed coati are among the significant mammals of the park. Birds in the area include the bald eagle, peregrine falcon and spotted owl. Camping areas throughout the park include developed campgrounds for RVs and groups, as well as primitive camping sites located at every elevation and in a wide range of terrain. Thousands of miles of trails allow for day hikes or overnight hikes through the mountains, valleys, along the Gila River and deep into the forest. Many of the trails are also accessible by mountain bike or horse. 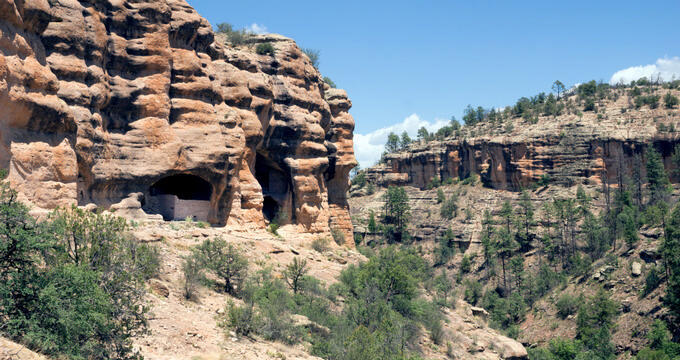 Also within the National Forest is the Gila Cliff Dwellings National Monument. A visitor center and trailhead museum at the National Monument offer exhibits and information on the cliffside dwellings and their occupation by the Mogollon people in the late 1200’s. The dwellings were only used for approximately 20 years until the Mogollon people moved on to parts unknown. Guests may tour the dwellings along an interpretative trail. Hot Springs within the National Forest are popular tourist destinations and include Turkey Creek, Middle Fork and the Jordan and Lightfeather Hot Springs. A few of the springs are within hiking distance of the visitor centers, and all may be reached by the trail system. Temperatures in the water range from 95 to 130 degrees. The National Forests’ Cosmic Campground has the distinction of being the only designated International Dark Sky area in the United States, making it an ideal location for stargazing. The majority of the National Forest falls under the darkest category of the Clear Sky Chart, an internationally recognized map measuring light pollution. White flashlights are not permitted at the campgrounds, and must be covered with a red filter. History: Evidence indicates the area was inhabited by humans, the Paleoindians, as far back as 9500 BC. The acreage preserved by the Gila National Forest protects this and the more recent history of the Apache and Mogollon native people, as well as the subsequent history of the arrival of European settlers, ranchers and miners. Petroglyphs and pictographs are located throughout the National Forest, as well as prehistoric cliff dwellings and ancient pithouses. Historic Interpretative Sites include the Catwalk National Recreation Trail, Wright’s Cabin and the Arrastra Mine Rock Crushing Site. The history of the National Forest begins with the Gila River Forest Reserve, which was established in 1899 primarily at the suggestion of naturalist Aldo Leopold (1887-1948). Leopold founded the field of wildlife management and was instrumental in convincing the Unites States government of the importance of wilderness preservation. In 1906, management of the area was transferred from the General Land Office to the United States Forest Service, and the area officially became a National Forest. Since, it has absorbed acreage from the Big Burros National Forest (1908), the Datil National Forest (1931), and the Crook National Forest (1953). Ongoing Programs and Education: Six visitor centers are located throughout the National Forest, and all host a variety of exhibits on the natural and cultural history of the area, in additional to recreational information. Star parties often take place at Cosmic Campground, in partnership with Friends of the Cosmic Campground. The 360-degree unblocked view of the dark sky makes it the ideal place for stargazing. What’s Nearby: For those who prefer to tour the area by car, portions of both the Geronimo National Scenic Byway and the Trail of the Mountain Spirits Scenic Byway go through the Gila National Forest.